This is the perfect giveaway to take your sewing to the next level! She is a beauty and her name is Rachel. Ready to take your sewing to the next level? 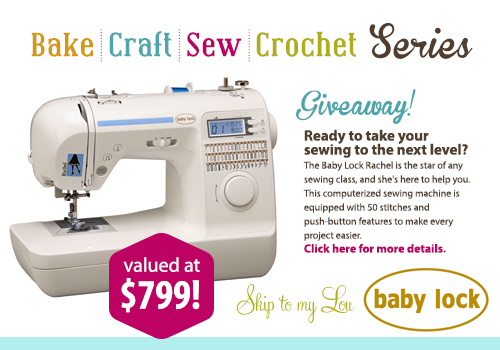 The Baby Lock Rachel is the star of any sewing class, and she’s here to help you. This computerized sewing machine is equipped with 50 stitches and push-button features to make every project easier. The value is $799. Click here for more details. Simply wait for RaffleCopter to load and enter there! are limited but my dream are not. Christine Mc Elroy of Winfield, Il. Sorry this is an old post. I hear so many good things about this machine. HOPE I WIM! A baby blanket (actually two) with stitching all around the edges specific for the gender of my boy/girl twins. Hoping to win the sewing machine. I really want one!! The best homemade gifts I ever received were baby blankets for my daughter. Best handmade gift i've made was a flower pillow for my best friend. I love all the handmade things my son makes for me. A beautiful pop-up card, a votive holder decorated to look like stained glass, a note holder with his picture on it, and more. Best Handmade gift ever received would be a polar fleece blanket with horses on it. It wasn't the design or complexity that made it the best, it was that it was from the kids that I'd babysat for a few years who made it for my graduation. A mailbox my friend decorated with our name on it. ...a bracelet from a special friend. A crocheted coin purse my grandmother gave me 35 years ago and still have. My grandmother made me a flannel backed blue jean quilt for my car when I started driving. I still use it in my winter luf today. A beaded Christmas ornament from my sister. One of my best friends made an accent piece, that hangs in the home I recently purchased, as a housewarming gift. She made it with her daughters in colors that match my decor. I simply adore it because it was made with love. A beaded necklace that my mom made me for my birthday. She even made matching earings! The best handmade gift I have ever received was a vest that my great grandmother knitted for my father when he was twelve years old. That was in 1933. My mother kept it all these years and it is in great condition. What beautiful work! Every stitch is perfect. My son wears it now. My sister made me a clock with pictures of me throughout my life at each spot where the numbers would go. It's beautiful! My mom made me a beautiful dress for a wedding in the beach. I love it. An adorable Christmas tree wall hanging with a string of lights from mom. Always wanted to try a Baby Lock machine. Heard good things. I honestly cannot think of a single handmade gift that I have been given - I'm usually the one giving them out! The best handmade gift(s) came from my grandmother. She was an awesome crocheter! I received afghans and many doilies, table runners and pillow tops and I cherish every single one of them. Now my mom has started gifting us with her quilting projects she completed over the years. I am very fortunate to have such talent in my family. a handmade card from my daughters. Honestly, I really cherish all homemade gifts because the person giving it thought more about what you might like and make it. They did not see something on a rack somewhere... they thought, planned, and executed your gift with you in mind. My wedding veil. My mom made it with lace trim from my grandmothers wedding dress. It was a special surprise on a day when I missed my grandmother so very much. Our oldest son knitted me a shawl a couple years ago that I love love love! Thank You! When the boys were young they gave me a handmade card with pennies and nickles taped to it. I still have it! My mother made me a beautiful little folk-style German dress when I was a child. I still have the dress decades later. And it is still just as beautiful. A quilt from my mother-in-law. Thanks for the giveaway! My favorite handmade item was a picture my son made in school for me. I have it frames and hanging on the wall. The best handmade gift I have received is a picture my son made in school. My grandmother and mom made a Sunbonnet Sue quilt for me with fancy embroidery stitches and completely hand quilted. Would love to win a machine like that. Have 11 grandchildren and 6 grt grandchildren. Could make all kinds of things. Thanks for chance. My best gift and I still use them today, are my soap dishes that my daughter made me a long time ago in school. Best gift I got was a quilt my great grandma made me. I was one of the last of 63 grandkids to get one. I still have it 30 years later. i received a beautiful drawing from my granddaughter, hanging on my fridge! Would love to win this machine! A quilted robe my mother made me. A quilted robe my mother made me, loved that robe. I got married a few months ago and a friend made me a beautiful mini wedding ring quilt. I love it because I hardly ever get handmade gifts. A cross stitched framed quote about friendship. I haven't received a homemade gift yet but I like to make homemade gifts. Last Christmas, I gave out homemade gifts and I know my siblings really loved them. I plan on giving homemade gifts again and it would be super awesome to have the opportunity to make them with this amazing machine. The best homemade gift I received was a scarf from my mother-in-law for my birthday this year! WOw, what a great give away. I love all these quick gift ideas being shared. I make lots of gifts throughout the year. I guess I would say a quilt from my Grandma in law. I love it! So warm and heavier than the average blanket! All things homemade are great to me! Would love to get this baby and explore my creativity! I simply love handmade gifts. I don't usually receive them... but they mean so much more if they are from the heart. My little sister gave me a little letter and a skein of yarn one year because she knew I had just learned to crochet. I sill have my letter and adore how cute she is! My two Daughter's (the one here in Ohio, the other in NC)..are new to quilting...and the both made "Disappearing 9 Patch" Quilts...different fabrics, & Layouts...& gave to ME last Christmas!!! "Bestest" Gifts ever!! :) Gorgeous! & both did AWESOME jobs! I have never received a homemade gift in my life time.I have however given alot of homemade gifts and will continue to do so.If I ever received a gift I would cherish it forever. A baby blanket from my sister in law. A wreath my friend made for me. Love it! About two years ago, someone gave me a hand-knit scarf. It was the first handmade gift I've had since my mom died. It meant so much! My mom made my kids personalized quilts using fabric from items that every member of the family contributed. They are very special quilts! All those handmade clay gifts from my kids in grade school. When I was about 10 years old, we did not have much money. New school clothes were not in the budget. One day, my Aunt & Uncle visited from far away and brought me a box of the most adorable skirts & jumper that my teenage cousin had made for me! They were the prettiest colors, the latest style, and fit perfectly! I have received so many lovely handmade things. Probably the most unexpected and most touching was a set of beautiful homemade aprons a friend made. Not just for me. She made one for me, my mother, my 2 daughters, and my 2 daughters' 18" dolls. I was shocked speechless at her generosity and love for me. The best handmade gift I ever received was a handmade wooden nativity set made by my sister. It is my favorite and I never have to worry about it getting broken by the grandkids. Best handmade gift is anything from my daughter that she made while in school. Those always meant the most to me. My mom made me a set of napkins that we use every day - 2 each of 4 different patterns, so now each of us has our "own" napkin that we just reuse until it's dirty, with a back-up set for wash day. Of course, now we're a family of 5, so for this year I've asked my mom for some more so that the youngest (currently too young for her own napkin) will have her own print. best handmade gift was a gorgeous crocheted shawl, in black, from my mother, love the thing. Best handmade gift was a memory quilt. It made stay learning how to make quilts. At the hospital here, there is a group of ladies who knit/crochet hats for all the newborn babies. I've kept each one that my kids have been given. My favorite handmade gift is a jewelry box my husband made for me for Christmas two years ago. We were robbed the first year we were married and my jewelry box he had given me was one of the items that was stolen. So 10 years later he replaced it and it's absolutely beautiful! My favorite handmade gifts are ornaments that my kids made when they were younger. They are very special and I look forward to hanging them on our tree each year. Thank you for the giveaway opportunity! Sewing is a family tradition in our home. Writing especially had been at the center of many a family gathering. Oh this beats my tiny machine by a mile. Perfect timing...my workhorse of a mini sewing machine has finally gone to meet its maker. My brothers girlfriend (when they first started dating) made me a crafting kit. It's what got me started back into being creative! Winning this would be amazing! Thanks! Best homemade gift: a "Cabbage Patch Doll" Loved her! My favorite homemade gift was the handprints of my little guy in salt dough. I love looking back at how tiny he was! My husband made me a beautiful jewelry box from an antique sewing machine cover. I have a great pin cushion that was handmade for me! My mom made me a marvelous outfit for my birthday in second grade. Best homemade gift were the mittens my late mother-in-law knitted for me. My grandma made me a handmade baby blanket for me and then 30 years laterade one for my son. 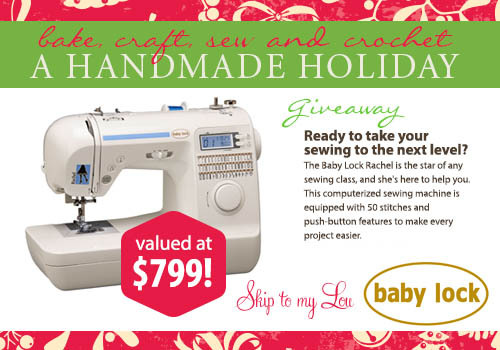 Would so love to win this sewing machine! So need a new one! I would love to win a brand new machine. It will help my sewing projects go faster and take things to the next level. Crochet baby blanket for me little monster! I received a nice framed picture of my family one year. my husband made me a side table out of reclaimed red bar wood... Amazing! My favorite hand made gift was a blanket from my Mom. There's something special about something that is made specifically for you, with love. A handmade lap quilt. Love them because I know how much work goes into them. My favorite handmade gift is anything my kids have made me. If I had to chose one it would be a small purse my daughter made her very first sewing project. My best homemade gift was Christmas ornaments that my grandchildren helped make. Would love a new sewing machine, I have many projects that I need to finish. Thank You. An afghan my grandmother made me as a high school graduation gift. Oh my!!!!!! I'm crossing my fingers for this one since I just had to toss mine! I've had my faithful Kenmore for years, but some time I will probably need a more modern, computerized sewing machine. It would be neat to win one! The best handmade gift I can remember was a simple clover-shaped cloth with rickrack around the edges and a basket to go with it to keep rolls and biscuits warm. I used that for ages and was even able to trace around it to make others. I would love to win. I make all Birthday and Christmas gifts. So it would sure come in handy. Also teaching my granddaughters how to sew. Thanks for the chance to win. my mother made me a beautiful dress for a weeding in the beach. I love it. I got 2 homemade quilts from my Grandmother. A handmade quilt at my daughter's baby shower. When I was 7 I got a homemade doll house with real wooden furniture and curtains :) I had never been so excited in my life. I have been looking to get a new sewing machine for well over a year. I'm still using the one my mom got about the time I was born and I just had my 39th birthday, lol. I best handmade gift I have ever been given was a quilt! I was just saying to myself how great it would be to have a sewing machine the other day so i can make things for my daughter! Fingers are double crossed! I've gotten so many great handmade gifts over the years it would be hard to choose. I've loved blankets, and crafts, and home decor. It's so nice when someone takes the time to make me something. I love that. My Mom made me a homemade quilt... that was unexpected and beautiful. My favorite handmade gift was a blanket crocheted by my mother. Sorry. Didn't know i had to put the best homemade gift I've received. Probably the lap blanket my mom made for me. I love it still! Would love to win this since my sewing machine has gone kaput! My best homemade gift was probably the quilt my grandma made me when I graduated high school. I would love to win this Baby Lock machine. I follow Skip To My Lou on FB but don't have instagram. The best handmade gift/s I ever receive are the ones my kids and grandkids make for me! Best hand made gift I ever received was when my kids were little and they'd make me hand prints in school. best hand made gift I have received is a sweater from my mom. A beautiful handmade quolt from a close friends grandmother. It was stunning. My aunt made me a quilt when I was younger. I still have it and it is used as a car blanket for my kids. best handmade gift was an afghan made by my grandmother - in 1970's colors of course! My Mom made me this doll that was five feet tall. As a young kid I thought it was amazing and had never seen anything like it. It was a great Christmas that year. The best homemade gift I ever received was a wooden kitchen set that my Pappy made for me when I was a little girl. I have been using a Brother Baby lock for that last 15 years - i love it but it is time for a new sewing machine! This would be perfect!! The best handmade gift I have ever received was a baby quilt for my daughter made by my grandmother who was going blind. My dad helped her every step of the way and bound it for me. It's a special reminfer to me of the love and sacrifice you find within the family. The best gift I've ever received was the handmade card from my 2 years old daughter. That was really touching. I remember a handmade Raggedy Ann showing up on Christmas morning from my mom when I was super young. I still have her, still treasure her. My Grandma makes us something every year. My fav is a Halloween table runner. She knows us all so well and chooses what to make for each of us. We are so blessed! My great grandmother used to sew us a nightgown every Christmas until she could no longer do it. I saved the last one she ever made me. It means so much to me now that she is gone. My sister knit me a cowl. Then when I showed up with a new winter jacket, she went out and bought yarn to match that jacket and knit me a second one! My grandma gave me a Holly Hobby quilt that she made. It was so beautiful! My friend knitted me a golden yellow infinity scarf a few winters ago and I still wear it every winter. It's super warm and makes me of her. Too many to mention but probably the cherry plant stand my father made me from the cherry tree cut down on our family farm and sawed on our sawmill. My mom made my kids each a Minky quilt! The best handmade gift that I have received was a quilt rack that my dad had made long before I ever started quilting. It is a perfect way to display my quilts! The first thing to pop in my head is the bookcase my Papa made me. It now lives in my little girl's room. A set of picture albums from my Mom. A warm and cozy knitted blanket for my baby. Keepsake for sure! My daughters to the age of 5 made me a pillow. Today she is 22 and I still have the pillow. I cherish any handmade gift my 6 yr old makes. My brother made me a chalk board using old slate from my Grandparent's house and barn siding that hung in our parent's basement. My grandmother made me some pillowcases with crocheted trim. They are beautiful and a reminder of her each time I use them. Would love to win, I would pass it on to my granddaughter for her to learn to sew. My dad built me a bed when I was little. He cut and carved every inch. In the headboard, he carved a "K" for my name. He stained it. I would Live to have this. It would make some projects much easier. My most treasured handmade gift is a Lucy pillow case my grandmother made for me when I was very young. I've been given several handmade gifts but one of my favorites is a floral picture my mother in law embroidered and had framed for us for our wedding! I will cherish it always! My husband built me bookcases for our new home a couple years ago, nice and sturdy, and well-loved! A dear friend made me a quilt. My most prized possession. Anything that my mom made for me. I have some of the items ... I wish that I had all of them. She died when I was 15. She really was a remarkable woman ... I wish that I had realized that then. I received a quilt from my grandmother which is what inspired me to learn to sew & craft. Best inspiration and keepsake ever!! My favorite gift was a handmade dress for my doll when is really small. Thanks for the giveaway. The best handmade gift I've ever received was a hand knit blanket from my little sister. I still love to cuddle under it! Best handmade item I received were to crotchet blankets for both of my girls when they were born. Clothes my mom made me when I was little. I'd love to win this machine! One of the best handmade gifts that I received was pillowcases created by my sister. A BabyLock would be a wonderful sewing tool at my house. Thank you for the possibility. The only handmade gift I have every received is baby blankets. They are great. Best handmade gifts were my fitted clothes from my mom. The best handmade gifts are the cards that my hubs draws for me. I love being married to a clever artist. They never fail to make me saw "aww" or laugh hysterically. My most cherished home made gift is a "godhudi" - quilt made from old saris that my grandmother hand stitched. The best homemade gift I ever received was a scrapbook from my Dad. He filled it with family photos taken from the time I was born until my own children were born. My wedding gown...my mom made it!!!! I got a baby quilt for my first child that my grandma made just before she died. It's a priceless family treasure! My wedding dress! My mom made it! My mother-in-law knitted beautiful blankets for my kids. I received a quilt made by my mother. What a lovely machine! I'd love to win it for a friend of mine that has just started (and fallen in love with!) sewing! The best homemade gift I've ever received is a needlepointed foot rocker from my Grandmother...not to mention all the hand smocked dresses she made me when I was little. A crocheted bedspread made for me before I was born by my grandmother. A handmade quilt from my grandmother! This would be the best gift ever, the gift that keeps in giving! Beautiful moccasins my mom made just for me. If I was lucky enough to win this sewing machine, I would sew pretty little dresses for my darling granddaughters! Thanks for the chance to win this awesome machine!!! The best handmade gift I have received is a handmade doll from my mom. A sweater knitted by my mother-in-law. Mu favorite handmade gift I've received was a quilt my mom made. I know it took her so long to do it and I think it was only her second time ever making a quilt. My parents are both so crafty and make awesome gifts! I received a beautiful handmade quilt from my mother in law, when I married her son. My Grandfather in law had made me a end table that I dearly loved, My kids have it now. My father built me a horse tack and equipment trunk. It is a work of art!! Best handmade has to be notes and painted rocks from my kids! A friend made me a bag from some gorgeous fabric. I've used it off and on over the years and it has endured. My uncle made me a cedar wood chest when I was around 11 years old. At 46, I still have it. My mother in law gave me a no-sew fleece blanket years ago and whenever I sit on the couch I have it on - it is so warm and cozy! Best handmade gift! My favorite is a handmade tooth fairy pillow my grandma made me back in the 80's. My 6 year old daughter is now using it! Thanks for the chance to win the sewing machine. Looking forward to all the great Holiday ideas. My favorite handmade gift had to come from a very special sister... from another mister:)... it was a gorgeous bracelet. Turquoise purple and silver. With crystals as well. It meant more than anything. And I still love and wear it almost daily!!!! I've received too many homemade gifts from my kids to choose, but my favorites include a ceramic bowl and a jewelry holder. Want to start sewing for my children and would love to have a sewing machine! Rag quilts for my niece and nephew. Last year, my dear friend sent me handmade gifts: Christmas yo-yos that I make hairclips for my girls and homemade apple sauce which my husband loves it! A knitted scarf... it's beautiful! The best gift I received was a necklace from my son for Mother's Day that said I luv you mom. The best handmade gift I've received was a set of night gowns my mom hand-sewed when she was bed bound with a broken ankle many years ago. It was just before Christmas and she knew I needed nighties, so she sewed them all by hand! My grandmother made a quilt that I love! Would love this machine to teach my daughter to sew. My brother made me a piano jewelry box. It had a key pad that played. It is something I will always cherish! When I was a little girl, my aunt made me a doll quilt. It had pink ribbons in a lattice pattern with blue yo yos to hold the ribbons where they crossed. I received a handmade quilt from my great-grandma for my wedding. A hand beaded coin purse for my wedding from my mom! Would love to sew with her! My aunt made me a scrapbook of my family growing up and I cherish it everyday! The best handmade gift I have ever received was, I think, the only handmade gift I have ever received, hand painted ornaments from my daughter and grandson. About 25 years ago, my mom hand made Christmas dresses for me and my sister. She saved them all these years and gave them to me for my little girls. Best. Gift. Ever. Best homemade gifts were homemade quilts. I'm very lucky to have such a talented mother in law. Winning this would make my year. Love the gifts my kids make in school but one of the best gifts I was ever given was a quilt that I had worked on with my grandma. Also, my daughter made me "coupons" for various amounts of her time (she was 13 @the time). I would give the sewing machine to her if I won...she is just learning but has a strong interest. Best homemade gift was a quilt made by my grandmother. Should have read the instructions first. Haha! The best handmade gift I've recieved is probably a pinafore dress my mom made for me when I was 10 just like the American girl doll Kirsten's birthday dress. Does anyone else lose complete track of time when they're sewing? I sure do. The worries of the world just fade away and its just my and my sewing machine. Love it. In the market for a new sewing machine, would love to win this! I can remember being excited about getting my grandmother's packages. She always sent homemade candy and made lots of clothes for me. I Remer one year she made me a sun dress that I loved. My raised gardening beds are the best handmade thing I got! Best sewn item...our quilt made by my mother in law. My dad built a bookshelf for me once. I was expecting something very basic, but he surprised me with a beautiful bookshelf that matched our house perfectly! My mom has made me many beautiful scarfs and shawls over the years. My favorite item she made though was a set of wrist warmers. I love them and take them to school with me every day during the winter. One of my most treasured possessions is a quilt my mother made for me a long time ago. Blankets for each of my babies. My husband made me a cedar coat rack. We have homemade Christmas love them! My grandmother made me a Barbie Doll dress that was a replica of her wedding dress out of material from her wedding dress. My grandma made me a quilt the year before she died. It has pieces of the dresses that my mom made for me over the years I was growing up. decorative shelf made by my dad! I have a baby lock now, I would love this upgrade! A beautiful quilt and pillow set. My mother was a quilter and made beautiful quilts for all of the family.Many memories with love went into every quilt. My favorite gifts came from my mom. Her quilts are proudly displayed all overour house. They remind me of how talented she was. A cover for my kindle! My craft obsession would be thrilled with this!!! My fav was a quilt. A beautiful quilt from my Grandmother. My niece made me a queen size yo yo birdhouse quilt all by hand. Love them both! My mother hand sewed, crocheted and embroidered an entire Barbie wardrobe for me. It is now played with by my niece. I could always expect a handmade nightgown on Christmas Eve from my mom. It meant alot to me then and now she does it for my kids. I hope to be able to carry on the tradition some day. I don't remember ever receiving a handmade gift! All the clothes my Grandmother made me when I was a child. For without her or the clothes I would have had nothing. And now at 49 she is teaching me to sew. Passing down the craft! My mom sewed me a lovely throw that I love to cuddle under. Thanks for the chance to win! Would have to be a Christmas tree my daughter drew and sewed together when she was 4 years old. Everything my grandmother made for me,I cherish! She was incredible! She would be able to make anything without a pattern and it would always be better than store-bought. She made me halloween costumes,stuffed animals, clothes, blankets, doll clothes, anything! I hope to be as much like her as I can be. My love of sewing, I owe to her. A prayer quilt. Each block represented a family member. Pottery pieces from a relative! Handmade soap probably. Other than all the adorable handmade things my daughter brings home! A quilt from my grandma. My son makes awesome picture cards. My mom made a cool crocheted thing for the middle of my table. I'm usually the one making the homemade gifts though. My favorite homemade gift was an awesome crocheted pink blanket made while I was going through chemo. T-shirt quilts for my children...that's what I would LOVE to make! Quilt from my grandmother when I went to college! Best handmade gift- a beautiful toy soldier sweater for my son, made by my grandmother. I've always enjoyed reading your blog. Dad helped me make my dining room table that I'd been dreaming of for so ling! I love it so much- hopefully something the will be passed down to the kids one day. A wooden stool my grandfather made me. My Favorite homemade gift was from my kindergartener, his little hand prints make my heart melt. A handmade quilt for our king bed!!! I have received many beautiful homemade gifts over the years, but the lace doilies made by my sister in Italy are most treasured. Pillows made by my sister. The best handmade gift I've ever gotten was a quilt from my grandma for my graduation. The best handmade gift I ever received would be the heart-shaped cushion that had my name embroidered on it that I got for my 12th birthday. It was especially memorable because I had so few birthdays growing up. My Daughter-in-love (law) makes me the most beautiful purses, curtains,; but she out did herself last Christmas when she made me a monogrammed tree skirt out of burlap!!! Well, I am usually the handmade gift maker so I don't get many. I can't even remember the last one I received. Oh wait, I loved the family recipe book my sister in law compiled for me. It was awesome! Thank you so much for the chance to win! I love to sew!!! A beautiful quilt for my first born. A photo frame made by my son. It was a gift for Mother's Day. A sweater my mom crochet for me! I would love to have this to make homemade gifts and teach my daughter how to sew! I made 9-patch baby quilts for friends and my own daughter. By far a favorite gift! My machine is so old I really need a new one. Would love to win! Looks fancier than my starter machine. Quits by my grandmother and mother. My wedding quilt. I received hand woven wall hangings from each of my sons. What a great giveaway! I'd love to have this!! My Granny has made so many things for me: cross stitch pictures, quilts, dresses for me, dresses for my daughter, and she even altered my wedding gown for me. She is the best there is. A neckroll filled with beads that can be heated or frozen...great for migraines!! Hand crocheted baby blankets from my Grandmother. I received an adorable bag that we use every time I take the kids to the library. It's so cute, durable and I get compliments on it every time! My Uncle Bob(who wasn't technically related to us) made my sisters and I a dollhouse, a doll crib and a horse stable. Completely original and still treasured gifts some twenty plus years later. After some extenuating circumstances, (illnesses), I stopped creating, baking, and sewing. Now that I am getting back on my feet-I'm feeling anxious to do creative activities again, but find myself with few ideas, supplies and accessories to get started. I'd like to enter the Baby-Lock contest. My grandmother made me a calico apron when I was a small child. She made it by hand. That was over fifty years ago and the hand stitches she taught me then I still implement in my own crafts. Oh, wow! HARD! My son painted a Scriptire verse for me for Christmas two years ago. Large subway art style. I love it. A hand knitted baby blanket and hat for my first child. A Blanket and bedding set for each of my 4 kids (3 boys ,1 girl), made by my Mum. Set up in a shoe box. Hours of fun for them all. a baby blanket for my son. The best handmade gift I ever received...tough one because I adore all handmade gifts. I especially love a hand carved figure made by my daddy. Needing sewing machine to fulfill my creative side. Would be blessed , Thankful & appreciative to win! My best homemade gift was a family photo card from my sister in law. A handmade sweater from my mom. Of course I paid for it (lol). My sister crocheted a huge blanket for my bed in shades of pink...and she hates pink! the best handmade gifts i get are from my kids. They have made me jewelry box, pen holder, clay pots and more. My husband made me a jelly cabinet one year - he kept it quite secret and it was a total surprise. Love it!! An antique handlerchief with myGrandmother drawn on it. My treasure! My Grandmother crocheted baby blankets for me and her famous pot holders. She gave them to me when I was a teenager for my hope chest. I still have them packed away for the day I get married and have babies to wrap with love in her blankets! My mother made me a key chain that said "You are my sunshine". I loved it. A hand crocheted tablecloth in the pineapple pattern or a large black and white bowtie quilt. Both were made by my grandmother. The best homemade gift I've received was a comforter for our wedding made by my sister-in-law. The best gift I've given was a homemade Raggedy Ann doll. A beautiful quilt my Mom made. A beautiful hungry caterpillar quilt from grandma for our baby! My favorite handmade gift was crocheted baby blankets for my boys when they were born. 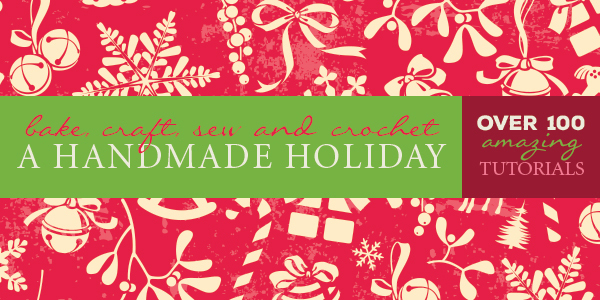 ANYTHING homemade is the best gift ever! I love giving and receiving homemade gifts! My son and I have been wanting a sewing machine!! a quilt from my grandmother. A beautiful mommy daughter matching apron set! One year for Christmas, must have been 1978 cause I was 6, my dad handmade a wooden kitchen for me. It was very realistic with real countertopping he had found, and a table and chairs. The fride had real wire shelves and the sink had a real (salvaged) tap. It was amazing! Homemade frilly underwear from my Grandma! I have so many. My favorite is a quilt Mom made me. I made a floor length patchwork skirt in the early 1970s. She saved it and some 20-some years later, Mom had added to it to make a quit. It feels like home. My mother gave me her old quilt that she made years ago. Each block has a handpainted Precious Moments picture, including ones representing me and my 2 sisters. She also included new material for me to re-back the quilt that was falling about. I'm super excited! The many beautiful quilts my mom makes for me! I love to sew and need a new machine!! My grandma once made me a pound puppy stuffed animal, I carried it around for years. A rag doll made by mother when I was 10ish. All the ornaments on my Christmas tree, made by my sweet girls, when they were little. Anything my Grandmother has made. My husband and I started dating right out of high school and after a year together he gave me a promise ring, but with it was a really sweet poem he had written onto a piece of art paper and decorated around it. Best handmade gift was a baby blanket and pillowcase. I am usually the one making gifts, no one really givings me anything. The best handmade gift I've ever received was a quilt. Hand knit socks. They were so squishy and warm and awesome. Definitely a big hit! An angel made from an heirloom handkerchief than belonged to a dear friend, made by her daughter for me. My cousin knitted a baby blanket for my baby shower present. Probably the best handmade gift I have received would be one of the sweaters that my grandma knit for each of my babies (her great grandkids. I will treasure those sweaters always. That looks like a sweet machine. I guess the best gift I recieved would be a sweatshirt my mom made for me awhile back. Would love to have a sewing machine. I have never had one. I am a Kindergarten teacher. The best handmade gift I've received was from a parent. It's a beautiful purse and beret that were crocheted with flower patterns. A quilt from my mother-in-law and father-in-law. Blankets and dolls made by a cousin. Would love to win this so that my little girl and I can learn to sew together! Thank you! My daughter made me a "sewing kit" out of a film container when she was around 6. My favorite handmade gift of all times. Best gift was when I was little, we were really poor. My dad died & there was no such thing as welfare. My brother & I got survivor benefits of $19 a month & mom got$36. My aunt made me a beautiful, long flannel nightgown, with lace. I didn't have to wear my brother's hand me down pajamas anymore. Forever my favorite. Knitted yoga socks! so cozy. A blanket for my son. The best home made gift I have ever received was a mason jar filled with homemade Ricky road. The lid was covered with a needle pointed Santa. It was so very cute. The quilts a friend made and gave to each of my children as they left home for college. My mother used her wonderful talent to make me a gorgeous dress. She put so much of her time and love into this dress. I am forever grateful for this gift. Homemade gifts are the best! Over the years I have received several. Which one is my favorite... they all have special meaning and each from a special person that took time for me! A handknitted scarf from my teenager! My mom made me yoga pants that are long and perfect and I love them! Handmade Cards for my husband! The drawings my children have done for me. I love Snoopy and the Peanut characters and they have each given me a picture/painting that they have done of Snoopy. I means so much because it came from them and that they chose something I have loved since I was a kid. I hope I win my old sewing machine my mom gave me is on its last leg . She bought it brand new in the seventies . It's made a lot of clothes and crafts etc.. I'm ready to start a new trend with my very own machine..
My best home made gift was a prayer shawl crocheted for me by a dear friend. All of the homemade baby blankets that I received after my daughters were born. The best handmade gift I ever received was a dark pink satin gown my babysitter made for my Barbie. I had never seen anything so fancy! The best handmade gift I've ever received was a quilt made by my mother and grandmother. Every time I look at the fabric scraps in that quilt, I remember a dress my mom had sewn for me, or a piece of my grandmother's old apron - just simple but precious memories. I much prefer to receive something homemade. Tells me that the giver is willing to put him/herself and time into a gift for me. My last comment got cut off. It was a knit sweater from my grandma. My favorite handmade item is a teapot cover from my mother inlaw. Crochet afghan made by my Grandmother. The baby blankets my mom has knit for each of my kids when they were born...she has knit them for countless family members and friends, all the same basic pattern but in different colours. I love them! The best handmade gift I ever received was the quilt my grandma made for me. I still use it. i have 2 favorite handmade gifts from growing up: first by my neighbor, second by a woman from an ALF i worked for. my neighbor adopted my siblings and i as grandkids since she had none. my son sleeps with a heart shaped pillow she made by hand with gingham and lace and my name hand embroidered on it. it's about 35 years old. the woman from the ALF was 99 years old and knit me a beautiful orange lap blanket that both of my boys were swaddled in as babies. My daughter takes pottery lessons and she has made me some incredible things. My favorite is a plate with her hand print on it and she decorated it to look like a turkey. I use it every year for Thanksgiving. I love it. The best handmade gift I received was a toilet paper holder that matched my bathroom one of my daughters made me two Christmas's ago. a crocheted blanket when my son was in children's hospital. I only had clothes on my back and I still have it and love it. A women't group made them and gave them away. Doll clothes from my mom, that now my little girl plays with. I would have to say the blankets my mom made for my children. A close second is my magnetic advent calendar my Aunt made for us. My kids absolutely love it and can't wait to get it out every year. So far any quilts my Mom has made are the best. She has such a great eye for color! A dress that my mom made for me! a shirt from my aunt . The best gift I made was a small teddy bear wearing a dress, that I made for my daughter when I did not have money to purchase anything. I made my son a blanket. The best handmade gift ever was a recipe box of all our family recipes. My aunt took the time to write them all by hand. My husband is an artist, so I am lucky to receive many handmade gifts but I think the best one was the mother's day card that he and my daughter made when she was about five and had just started writing herself. It was so great to see how proud she was of making something special for me. An afghan made by my grandmother = this was 30 years ago and I still cherish it. The best handmade gift I have ever received was some handmade custom stationary. I love to write cards and having something so unique and beautiful was really special. The best handmade gift I received was a sculpture that my dad made from copper wire. The best handmade gift I ever got was a sweater that someone knitted mw. Pictures drawn by my little girl. Quilts, quilts and more quilts - I've never owned a store bought blanket! My Grammie made them when I was little and now my Mom makes them..... I love them all so much! I even started making some - last year I made a little quilt for a friends daughter and this year I'd like to make her an I Spy quilt. My grandmother made a beautiful flower garden quilt for me. My mom made all of my dresses growing up, as well as all the bedding and decor for my son's nursery. She even hand-sewed beads back onto my wedding dress after hemming it 4 inches. the best handmade gifts i've received was a christmas table cloth/napkin set my mother-in-law made..and a scarf my aunt crocheted. My daughter made a beautiful carved and jeweled wood picture frame for us. We have it displayed in our dining room with a photo of her and her husband. It's one of the best gifts I've ever gotten. The best handmade gift was a Dresden Plate quilt that was made by my grandmother with fabric from clothing my mother wore. A "ribbon" knit scarf from my friend Patty. She made it in Fall colors and I think of her often during that time of the year. I was given a beautiful quilt by my grandmother! knitted slippers from my mom, Loved them then and still do! A member of my knitting/crocheting group crocheted me a bookmark and a votive cover. I have never received such a heartfelt gift. The best handmade gift I've ever received was from my mom. She made the quilt and bumper set for the nursery before my son was born. Handmade candles, they smell so good! Marisol that is so sweet! I made a sweater once but am really a basket weaver. I would love to learn to sew. They're not technically for me, but the blankets that my sister made for each of my kids are the best handmade gifts. The blankets make each child feel special. The scarves and slippers my mom makes. A gorgeous scarf from a friend. It was made with the most luxurious, soft yarn ever. I have a very treasured quilt my grandmother made for me many christmas ago.